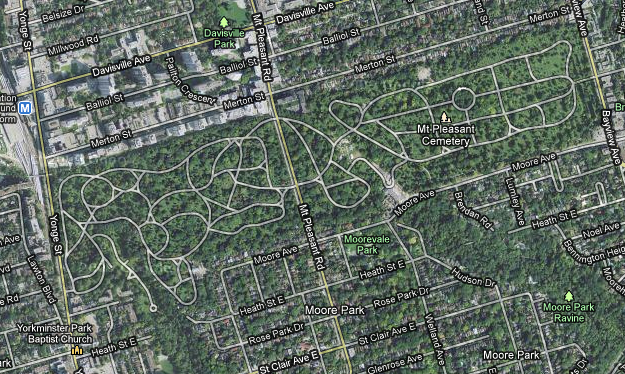 On to Mount Pleasant Cemetery! For those readers not familiar with the project, our partners at FamilySearch Indexing make the images and the indexing software available online. We do the indexing on our own home computers and the data is uploaded to FamilySearch. When the project is complete, the index and the images will be available online and free of charge. We have indexers all across Canada as well as in England and the US. All you need is a high-speed Internet connection. Read more about the Toronto Trust Cemeteries project. Together, we have indexed more than 25,000 names in the first months of 2011. The new Mount Pleasant registers look very much like the Necropolis registers we’ve been working on for the last couple of months. You could hide the “Nearest Relation” fields for now, but you will need them again in a few weeks. Here are instructions. You’ll also find some history about Mount Pleasant on the blog. It is a very beautiful place, full of magnificent old trees and rare species. As the weather improves, I’ll be sure to post some photos. Spring is only a week away. Can’t come soon enough! This entry was posted in Toronto Trust Cemeteries FSI and tagged Mount Pleasant Cemetery by Jane E. MacNamara. Bookmark the permalink. While indexing Mount Pleasant today I came across a young member of the KING family….the cemetery is full of them, and they are ancestors/relatives of my sons. I was so pleased to be able to add to my PAF file details like “cause of death” and “date of burial”. This is an excellent opportunity to “flesh out” one’s family history and I hope to come across more as we work through this cemetery. What a lovely project! I’d used the index and books at Mount Pleasant years ago and wondered when it’d be digitized. And now I’m wondering if the transcribed data [sets] provided to FamilySearch will be available in a free, open format, for remixing (e.g., add geo-coordinates to create a mapping application). Does FamilySearch share their data [sets], other than making it accessible through search?